This elegant herringbone knit cardigan is from Italian designer Elena Miro's exclusive White Label collection. 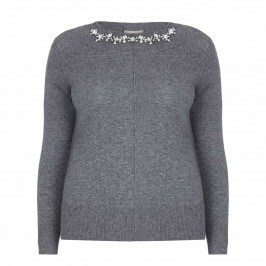 In a delicate shade of dove grey - with a touch of cashmere; it's utterly soft and endlessly stylish. The decadent fur trimmed hood evokes the glory days of air travel - think Jackie O or Joan Collins touching down at Heathrow - just add a pair of trademark Dior sunglasses. Dove grey herringbone knit cardigan. 46% Wool, 33% Polyamide, 15% Viscose, 4% Cashmere, 2% Metallised Fibre. Hand Wash or Delicate Dry Clean. (Fur trim should be removed beforehand and cleaned by specialist fur cleaner). Model’s height is 178cm (5ft 10in). One Size = UK size 14 - 24. For more information, please call customer services on +44 (0) 20 8455 0005, or one of our stores.